Becoming a Division I player in the process was just icing on the cake for the Park Hill senior. She recently inked her letter of intent to play softball at College of Holy Cross in Worchester, Mass. Morehouse admitted she hadn’t heard of the college until she was contacted by the staff for the Crusaders after seeing her video on NCSA’s website. She plans to be pre-med major in hopes of becoming a trauma surgeon when her playing career is over. Morehouse was a jack-of-all-trades player for the Trojans over the past four years. She was a four-time all-district player and all-conference player the past three years. She played at seven of the nine positions on the diamond in her four years, the only exceptions were center field and catcher. She mainly played the corner infield spots and threw. 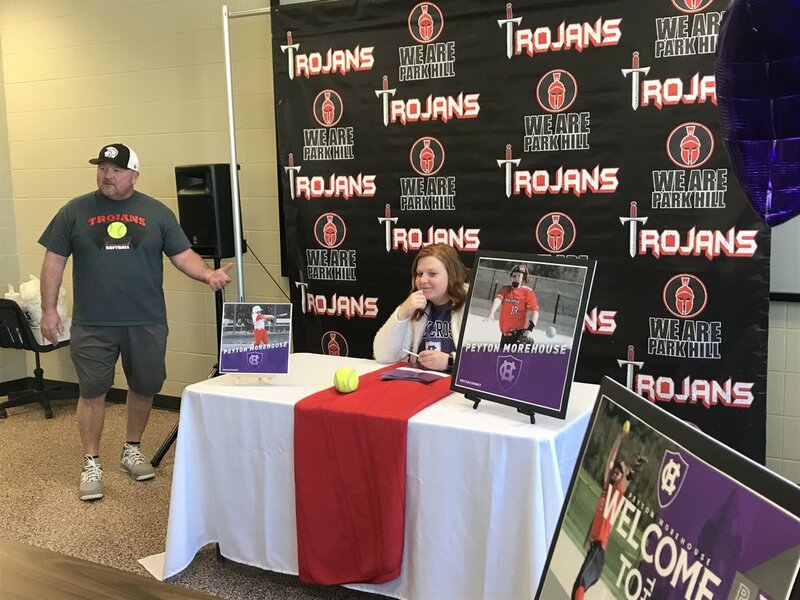 Park Hill softball coach Jackie Qualls, left, talks about pitcher Peyton Morehouse during her signing ceremony with the College of Holy Cross in Worchester, Mass. She will continue to pitch for Holy Cross and will have her belt in the lineup. Still being able to hit was big for her being a pitcher. Some of the other schools she looked at either wanted her to hit or to pitch but the chance to do both sold her on Holy Cross over such schools as St. Louis University, Bradley and Washington University in St. Louis. Hitting is something that comes natural for Morehouse who hit over .400 in three of her four years in high school. In her freshmen and sophomore seasons she batted .426, while hitting .411 as a junior. She closed out her senior season with a .380 mark. She had at least 29 hits in each season and drove in 68 runs in four years. She helped the Trojans pick up their first Suburban Conference Gold Division win in the fall, after going winless the first two years after moving up to a division. Morehouse will play for a travel softball team out of Kirksville this summer before moving to Massachusetts in August to start getting ready to play for the Patriot League school.